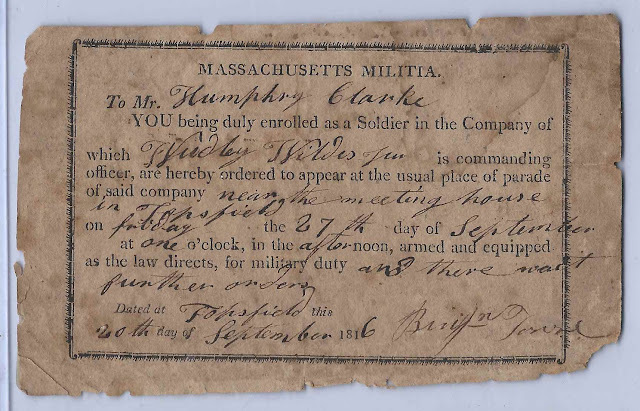 1816 Massachusetts Militia document summoning Humphrey Clarke to the Meeting House in Topsfield, Massachusetts. Humphrey was "enrolled as a soldier in the Company of which Dudley Wildes, Jr., is the commanding officer." The name at the bottom of the document appears to be Benjamin Towne. The document measures approximately 5-1/2" x 3-1/4" and is dated Friday, September 27, 1816. 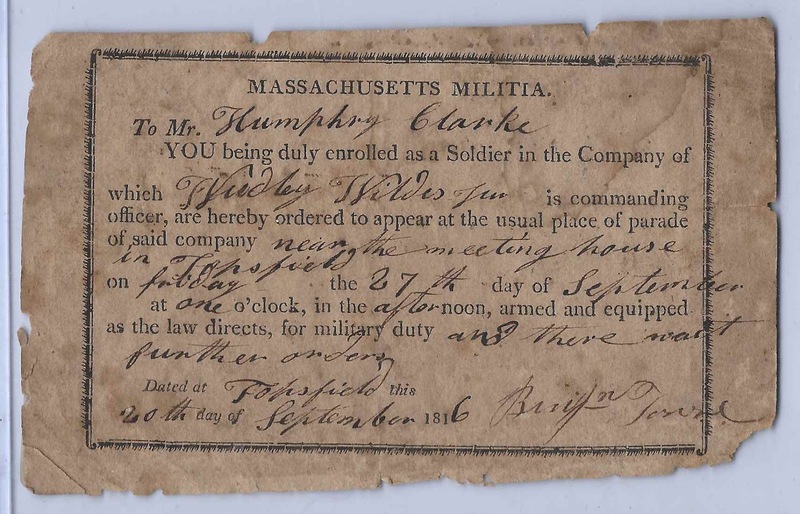 Humphrey was perhaps the Humphrey Clarke who was born at Ipswich, Massachusetts, on 7 January 1783, son of Israel Clarke and Ruth (Clark) Clarke and husband of Mercy (Clinton) Clarke. I had a hard time deciphering the first name of the commanding officer Wildes, Jr., but from checking online I believe he was Captain Dudley Wildes, Jr., born in May 1786 at Topsfield, Massachusetts, the son of Dudley and Bethia (Harris) Wildes and husband of Abigail (Bradstreet) Wildes. Benjamin Towne was perhaps the Benjamin Towne born at Topsfield, Massachusetts, on 22 December 1793, son of Jacob and Rachel (Cain) Towne and husband of Sally (Boardman) Towne. If you have a better idea of the identity of the signers on this document, please leave a comment or contact me directly. Thanks!